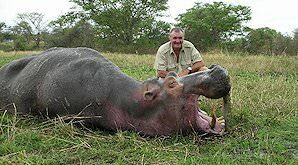 Dangerous game that can be hunted in Africa include the Big Five as well as hippo and crocodile. An African safari can provide memories for a lifetime, particularly if there is dangerous game on the quota. Preparation is of the utmost importance - the right rifle, in the right caliber, with the right bullet, can make the difference between a successful hunt and a very expensive stroll through the bushveld. At the risk of sounding melodramatic, using the right rifle for dangerous game can mean the difference between life and death. Trust your Professional Hunter's advice in this regard and then practice. Sight-in on the bench and then shoot from the sticks, off-hand and the various other positions you may encounter in the field. Be comfortable, thoroughly familiar, and proficient with your weapon of choice. Remember: “it's where you shoot him, and not what you shoot him with, that is important!" And, as one of our professional hunters is fond of saying: “Shoot straight and always use enough gun." 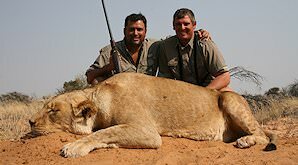 We offer dangerous game hunting for lion, leopard, white rhino, elephant, buffalo, hippo and crocodile. The area in which the dangerous game hunt is conducted depends on the species which interest you. 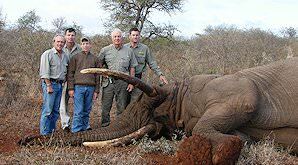 All of our professional hunters have many years' experience in pursuing the dangerous game of Africa. Our success rate on all animals (except the elusive leopard) is very close to 100%. Please try to book you dangerous game hunt at least six months in advance, as we require some time in order to obtain the necessary permits from the relevant authorities. Buffalo are the most popular and arguably also the most dangerous animal that can be hunted on a safari in Africa. These massive bovines have a reputation for doubling back once wounded, and it is very important that you are accompanied by an experienced PH to ensure your safety when hunting the most unpredictable member of the Big Five. 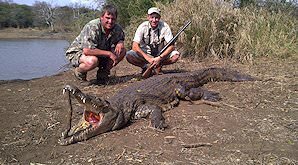 Crocodiles are not the most popular of the dangerous game animals that can be hunted in Africa. They do, however present a very challenging and enjoyable hunt that will test the marksmanship of any hunter. These great reptiles make a very impressive full mount trophy and should definitely be considered by avid African trophy collectors. The elephant has, for centuries, enticed ivory hunters to African shores. Populations in Southern Africa are very stable and in some areas there exists a substantial over population of these largest of mammals. Elephant can be hunted in the wilderness areas of Zimbabwe as well as in the areas surrounding the Kruger National Park in South Africa. The hippopotamus can be an extremely dangerous animal to hunt. They spend their days wallowing in waterways and dams. These sanctuaries are normally left at dusk to graze in the surrounding area. If threatened, they will instinctively return to the water and present a grave danger to anyone in their path. Hippo tusks are prized trophies which will serve as a reverent reminder of the days devoted to hunting the animal in Africa. Leopards present the most difficult dangerous game hunting safari in Africa. The most elusive of the African predators, leopards are solitary animals that often traverse very large home ranges. They will normally be hunted over bait, a process that requires a lot of patience. 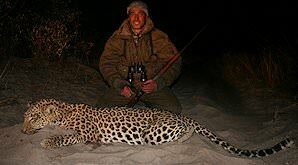 Once the hunt has been successful, though, you are sure to treasure your leopard trophy as one of your favorites. Lions are hunted in the Kalahari region of South Africa, in the company of highly skilled bushman trackers. The sandy soils found in the region provide ideal terrain for tracking the lion on foot - a very exciting hunt. After buffalo, lions are the most popular of the dangerous game animals that can be hunted in Africa. It is an adrenalin-filled experience never to be forgotten.